I have a feeling a lot of people might not agree with me putting such a current movie this high on our 31 Great Horror Movies list. But I have a great defense. As a life-long horror movie fan, I’ve always had to rely on horror movies that were always around, many made even before I was born. I could no longer be scared by a movie. I could appreciate them, but couldn’t be scared by them. Then “28 Days Later” came out. And it scared the hell out of me. So that instantly became one of my personal new classics. Not only did it scare me, but I was actually able to believe it. It’s the only zombie/apocalyptic movie I’ve ever seen. Every detail of how this outbreak happened was explained. And explained well. Backing up, “28 Days Later” tells the story of a “virus” that has broken out in London. The virus is called “Rage” and its symptoms are like nothing we’ve ever seen. The change is instant. The eyes turn red. You spit blood everywhere. You’re an absolute maniac. Twenty-eight days later, most of the population is dead or also infected with Rage. An bike courier named Jim (Cillian Murphy), who was injured more than 28 days ago, wakes up in a deserted hospital. He has no idea what has been happening. He wanders out into the empty London streets where he sees trash in the streets, burned out cars and no one else in sight. Except for rabid zombies. And they’re coming at him fast — far faster than previous zombies we’ve seen. 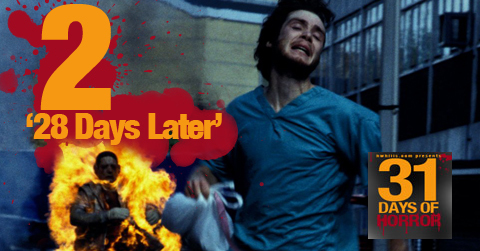 Following other zombie film formulas, Jim runs into other survivors and together they fight to stay alive. But again, there’s just something better about all of this. Oscar-winning director Danny Boyle‘s use of digital video ads an extra layer of something new for us. The shots are jagged and raw, which makes the zombies even more scary. Boyle’s genius really shines in this film. “Slumdog Millionaire” what? Watch this movie. Now. The mood is just right. Did You Know? The ‘design’ for the symptoms of Rage was based on Ebola, which is communicable in all primates (including humans), and is transmitted through the blood. Ebola is a hemorrhagic fever which leads to a rash, red eyes and both internal and external bleeding.